I watched DON’T BE AFRAID OF THE DARK (2011) on 8.14.12. It was my first viewing of the film. This is one of those movies which never fully got itself where it wanted to go. It looked nice (as long as no CGI was taking place) and the performances felt decent enough. The story, unfortunately, is filled with holes. The idea is that Guy Pearce and Katie Holmes are renovating a house (and, incidentally, dating). Pearce’s daughter Sally (Bailee Madison) comes to live with them. Problem is, the house has these little tiny fairies which live in the fire pit. And they love to eat children. Until the very end, this movie is never scary. Spooky at times, startling at others, but never really scary. The biggest problem is that the fairies just aren’t that frightening. They are annoying to be sure. They pick up razor blades and scissors and they will prick the crap out of you. But it just never feels all that intimidating. Adding to the problem is that these characters are written to be oblivious to how this sort of things work. Katie Holmes’ Kim does the leg work to find out that little Sally isn’t lying. Instead of being frightened by the fact that children have disappeared from the house, she takes her time in getting Sally out. Only Kim is written to be strong and level-headed. It’s woefully inconsistent in the writing, even as Holmes’ does her best to make it all work. In this film characters leave others behind in the dark, they don’t turn on lights when flipping a light switch would save them (and they know this), and they don’t just GET OUT OF THE HOUSE. It gets to be fairly mind-numbing. Which, again, is just too bad. The gothic feel of this is haunting. Director Troy Nixey provides us some appropriately spooky shots of the house’s exteriors as well as several effective claustrophobic shoots for the interiors. This is just another example of a film handicapped by its script before it even starts shooting. Of course, the post production didn’t help much either. The editing provides an odd timeline. At one moment Sally is in bed, the next she is up talking, and the next she is fast asleep. We have no sense of how the timeline flows. The CGI, additionally, is just brutal. It’s the kind of CGI which undermines the film’s attempt at being scary. It’s just too bad. On a plus note, it’s nice to see Katie Holmes doing well again. She had a promising little career until she derailed it by marrying Tom Cruise. 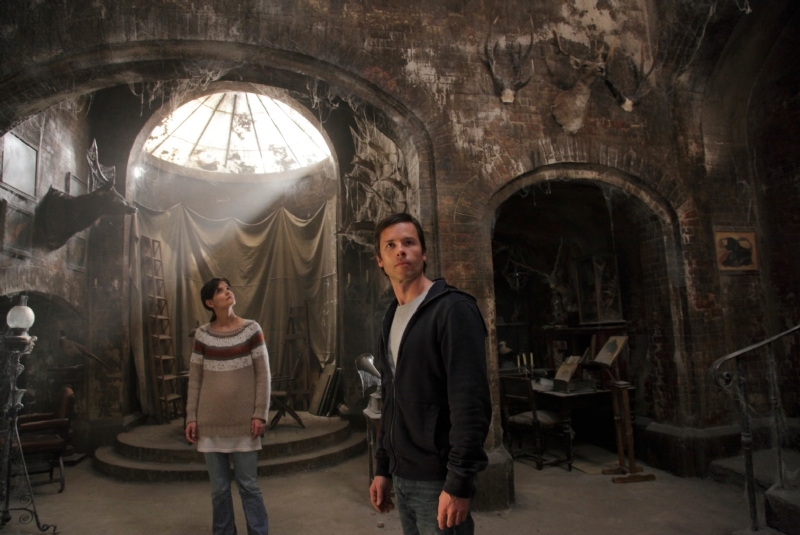 DON’T BE AFRAID OF THE DARK is a nice performance, even if it is an example of someone working with a character well below their ability level (the same could be said of Guy Pearce here as well). I’m glad I saw this. It’s a half-decent little house-in-distress story. But I’m not sure I’ll be rushing back to revisit the movie any time soon. The negative bonus is for the bad CGI. Just bad, bad stuff. Kills the mood multiple times. ~ by johnlink00 on August 15, 2012.